A few years ago, I used a serving spoon instead of measuring cups to plate dinner. If I looked at a nutrition label, it was with passing interest. I left the house with nothing but keys, wallet, and phone. Having diabetes takes away many simplicities I once took for granted, like packing a school lunch. During a particularly harried morning, I remembered the Leaf & Love Lemonades that I won from their Instagram giveaway. I threw one in his lunchbox and a wave of simple joy washed over me. It reminded of life before diabetes, when I could just hand my son food without solving complex math equations or worrying about the effect it would have on his immediate and long term health. This d-life is hard, but it certainly allows for celebration of the simple, like an in range blood sugar or an awesome lunch. Please read the disclaimer. 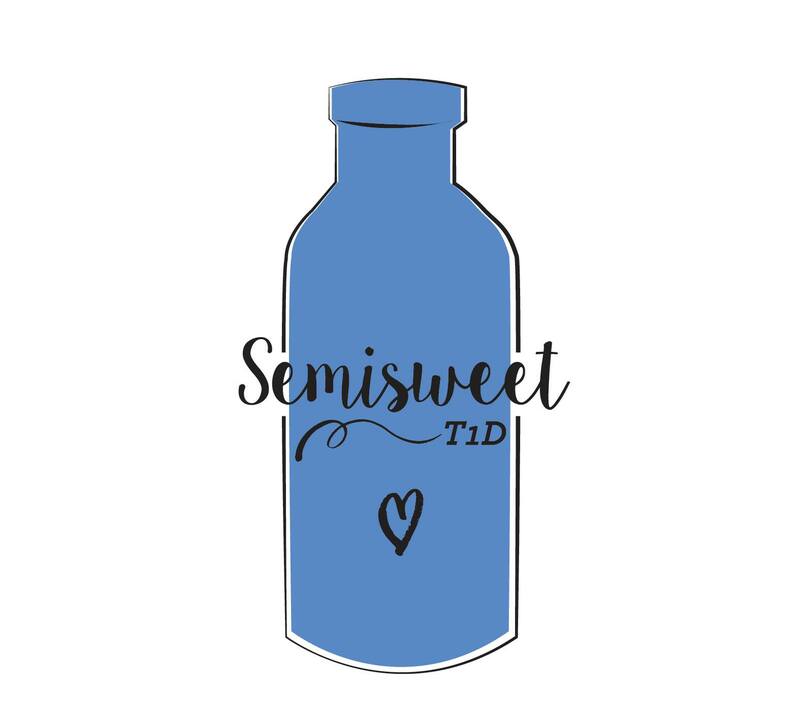 Semisweet does not receive compensation for its posts. I was middle school dance nervous the night before visiting my son’s Kindergarten classroom. The plan was for me to read Go, Team Coco!, a book that helps educate young children about type 1 diabetes, to Henry’s class. On our walk to school, Henry was excited and asked if I could stay all day. His big sister wanted to know if I could read to her class about diabetes. Truthfully, I didn’t want to read about diabetes at all. I didn’t want to put any fuel on fears for the future, but I sat down at story time and told the class, “One day when Henry was three-years-old he got very sick, but then he got better. He wears a pump and CGM to help us keep him healthy,” and a strange movement caught my eye from the center of the rug, where the kids were seated. I saw Henry reach into his pocket to get out his pump and show the class. His teacher suggested that he come and sit next to me. With a smile, he joined me in the front of the room. He showed them his pump, (and it’s a really cool pump, by the way, sometimes it turns into a pump laser or a really, really bad disco laser, so Henry says). I read some of the story, and Henry explained what it was like to feel low, when Coco was low. We finished the book and unprompted, the kids all chanted, “Go Team Coco” with me. And then the hands shot up. I learned which kids have asthma, another kid described how his grandma checks her blood sugar, another kid’s sibling has type 1, another grandparent has diabetes, and another. For a strange moment, diabetes unified a room of Kindergartners, who talked so eagerly, wanting to be part of something by sharing their experience. As Henry lives with diabetes, I know all his peers won’t accept him as easily as this room full of Kindergartners, but many will. I tucked the book back in my bag for the short walk home, and it occurred to me that since diabetes takes so much from us there’s no need for me to build straw houses of fear that I’m afraid will burn at some future time. Sometimes, it’s me, and not diabetes that’s the gasoline. In this present moment, none of my fears mattered. My son was a few blocks away, in a room full of curious friends, wearing an awesome pump laser. Parents of young kids with T1D know that sweaty palm, nervous gut feeling of leaving their child with someone new, especially someone new to diabetes. Handing over the diabetes equipment means handing over trust of your child’s consciousness, and over time, his or her long term health. It’s never easy to do this, but for two years, we worked with two amazing preschool teachers who share their experiences of learning about Type 1 and managing it in a preschool classroom. “When Type 1 Knocks on Preschool’s Door” is by Jessie Blohm. It has been two years since diabetes knocked on the classroom door. Two years ago we were, admittedly, afraid and unknowledgeable. Two years ago, I could have told you the difference between Type 1 and Type 2 only by way of saying that Type 2 was the kind that elderly people can develop and a result of the obesity epidemic. Other than that, I had no idea what the difference was or how much we would learn in two short years. Insulin, units, blood glucose (BG), meter, lancet, pump, bolus, combo bolus, pre-bolus, etc…the language alone was enough to make my head spin. How were we going to learn all of this in one week, so that we could keep Henry safe at school? It didn’t matter how, it just mattered that we would. A couple evenings of reading The First Book for Understanding Diabetes and a crash course in testing with the meter and we were on our way. Well, not quite that easily, but it did happen that quickly. I believe that there were 4 key factors that made Henry’s time in our classroom so successful and relatively stress free for his parents. Henry’s parents were willing to meet with teachers before the start of school with step by step handouts, powerpoint, scales, cheat sheets— anything and everything they could think of to inform two lead teachers and a handful of college students on how to best care for their son. Rachel and Matt were able to answer questions when we had them, walk us through as new situations like priming the pump or delivering a combo bolus arose. They stressed the importance of realizing that there was no “normal” situation when “managing” diabetes and that so many factors play in to Henry’s numbers on any given day. They gave us a list of our typical snack foods as well as the portion sizes and carb counts, taught us how to weigh foods for lunch, and count carbs in each serving size. We used those cheat sheets religiously and by the end, we were able to take a cooking activity for the classroom, modify the ingredients slightly, and figure out how many carbs were in it so that we could give Henry the correct amount of insulin and most importantly, that he was able to participate in the same activity that the rest of the children were. Before going outside for large motor, “Henry, let’s check you.” While at group, “Anna, will you check the CGM?” While getting ready for lunchtime, “Lexie, will you text Rachel and Matt to check if that amount of insulin sounds correct, it seems high.” Preparing for a center time cooking activity, “Double check my math on this portion size for the cooking activity, do you get the same numbers that I do?” The CGM needs calibrated, “Two different checks (pokes) this time, Henry.” In the beginning, this was a complete tag team effort between us as co-teachers, standing shoulder to shoulder at the counter as we figured the carbs for his lunch/snack/activity. After two years, it was like a well choreographed dance, we were able to have a quick conversation about his numbers that day, make a guess on how lunch/snack/activity would effect his blood glucose, and move between the different roles as lead teacher/lead caregiver with ease….but it took a lot of “checks” to get us there. It had to have taken an amazing amount of trust on Henry’s parents behalf to hand over his backpack each day and trust that we were going to stay on top of his numbers, catching any highs or lows from a new breakfast food, our lunch menu, and his activity level. Trust in our student staff and their training when we were out of the room or in a meeting. Trust in the CGM in order to avoid an unnecessary finger poke. Trust in the Dexcom app and knowing that there were 4 sets of eyes randomly checking his numbers throughout the day and sending a precautionary text to whomever was with Henry (teacher/staff), just in case they hadn’t caught it. In our classroom, we call everyone “friends” and we work hard to promote acceptance, resilience, and kindness. After diabetes knocked on the classroom door, we had a new topic to cover. Sugar. Much like we begin every school year creating that classroom community, we hit all of our usual likes/dislikes, how we all are the same and how we are different, etc. It was decided that we all liked sweet treats and we all understood that too many sweet treats would give us a tummy ache. However, for Henry, his body needed help with the sugar and he had to wear the pump so that it would keep giving him medicine in order to be safe. The children were so accepting of this! They would occasionally take an interest in watching us check Henry’s BG, ask an occasional question, or tell us they heard a beep from the pump, but more often than not, they didn’t even notice anything different! Henry was resilient, could go wash his hands, check his BG quickly, and return to his play with little interference, it was just accepted as part of the classroom routine and community. In all honesty, acceptance, resilience, and kindness are probably the best qualities in young children, and the rest of the class made it easy. I only hope and pray that the rest of Henry’s years of school are equally as accepting and kind to him. Jessie Blohm is a teacher and a mother, holding her Masters Degree in Early Childhood Education from the University of Northern Iowa, while earning her Mother of 3 degree at home in her partially remodeled farmhouse in Reinbeck, IA. She lets her kids run barefoot and would rather pick weeds in the garden and drive kids to soccer practice than cook any day. In this guest post, Rhonda Morgan, a registered nurse, describes how type 1 patients in diabetic ketoacidosis (DKA) and severe hypoglycemia were treated in the emergency department in the 1970s and 1980s. Rhonda’s understanding of type 1 diabetes changed in 2014, when the clinical became personal. I began my career as a registered nurse in 1974, the summer I graduated college and passed my board exams. This was one of the sundry times there was a nursing shortage, so I started to work as a new graduate in a very busy emergency department (ED) of a 500+ bed hospital. It was grand. The ED affords ample opportunity to see just about everything. And we saw a lot of patients with diabetes in those days, primarily adults in DKA. Another frequently seen diabetic-related emergency was hypoglycemia (“insulin shock,” as it was known then), and these patients all too often presented to the ED, unconscious, with seizures, and with a very low blood glucose. Many doses of D50 (dextrose 50%) were administered empirically to known patients with T1D presenting with these symptoms. Likely no state of unconsciousness is as easily and instantly reversed. Occasionally, a child would present to the ED and be diagnosed with type 1, but children were always admitted to pediatrics, and never hung around in the ED for very long. The adult type 1 patient in DKA was one of my favorite patients to manage and care for in the ED, because the course was so dynamic, and one could see the favorable results of treatment over a short period of time. One of the really great ED physicians, with whom I worked for many years, would elect to keep these patients in the ED and treat them, as opposed to admitting them to the hospital, if they did not have insurance. This was much more financially feasible for the patient and family, plus the patient had constant care. In those days, we had no bedside (point of care) blood glucose testing. We tested for glucose in the urine of our patients with diabetes using clinitest tablets. The clinitest method involved shaking a tablet out of the bottle into the test tube (because you could not touch the tablet with your fingers), adding 6 drops of urine and 10 drops of sterile water and waiting for the chemical reaction to occur. The contents of the test tube would fizz and generate heat, and then change color. After 30 seconds, one would compare the color of the liquid in the test tube to a color chart to determine the corresponding blood glucose. The test was very imprecise, but none the less we used this method of testing for glucose, along with blood tests that were sent to the lab, and took an hour or more to get the results. A few years later, test strips were available, but again, this method tested for glucose in urine and was not a direct or current measurement of blood glucose. DNA recombinant (Humalog/Novalog) insulins and basal insulins were not yet developed. We had regular insulin, NPH, Lente insulin, and ultra-Lente, the last two being longer-acting insulins. All were bovine origin. Later in my career, I worked in critical care as a clinical specialist and helped institute computerized, and then later, web-based algorithms to manage hyperglycemia of critical illness, prevalent in both diabetic and non-diabetic patients in the ICU. So, I have been around a lot of folks with diabetes. I have managed treatment and cared for of a lot of folks with diabetes in DKA, and in critical illness situations. However, I knew nothing about how to manage and oversee the maintenance of T1D until my grandson, Henry, was diagnosed with T1D at the age of 3. Then, I saw the “other side” of diabetes— the personal side, not the clinical rescue, critical, immediate treatment regimen, but the everyday, every night, day-in, day-out routines that must be undertaken to keep him safe in the immediate, and to offer the best odds of avoiding the long term complications of diabetes. This side of diabetes management is just as critical as the side of diabetes care with which I was so familiar. Our entire family had a learning curve that was fast paced. It was not easy, and it is not for the short term. It is for life. Henry was started on multiple daily injections at diagnosis in March 2014. Needless to say, this approach was filled with anxiety and unpleasantness for all. Thanks to his smart and advocating parents, he got his insulin pump and continuous glucose monitor in late May, just shy of 3 months into his life with diabetes. The pump ushered in a new learning curve, and the continuous glucose monitor gave us an eye on previously unseen data. How I wish Henry did not have to live his life with diabetes, but he does. I think back to 1974 and putting those 6 drops of urine in the test tube and feeling the warmth of the chemical reaction in my hand, and I contrast that to a direct blood glucose value we get multiple times daily in just seconds, CGM data transmitted over an iphone around the world, and insulin delivered with a pump, and I am confident Henry can have a happy, healthy productive life. Matt: Henry has type 1 diabetes. This means that his entire life is centered around the fact that his body does not produce the insulin he needs to process glucose, so we check his blood sugar about ten times a day by poking a small needle into his finger and adding that drop of blood onto a meter that tells us what his BG (blood glucose) is. Depending on what the number is, we give him insulin, sugar, or wait. This means that we deal with low blood sugars, which are potentially, immediately, fatal; high blood sugars, which can have drastic, long-term consequences for his life; or “normal” blood sugars, which help keep him healthy. We get up every two hours every night to help maintain his blood glucose. Two weeks ago, Henry looked at me and said, “Diabetes is a hard life.” I agree. Rachel: Our son, Henry, has an autoimmune disease, type 1 diabetes. Something triggered his beta cells to stop producing insulin, so he must take subcutaneous insulin for the rest of his life, test his blood glucose 8-12 times a day and always account for the carbs he eats with insulin. There’s never a break from type 1 diabetes, because the person with diabetes or the person’s caregiver/s is trying to replicate a job the pancreas once did. Matt: We make sure that he gets enough insulin to cover the carbs (sugars) he eats so that his blood glucose does not get too high and cause damage to his organ systems. We also make sure that his BG does not drop to a low level that could result in seizure or death. We count all of the carbs he eats and program his (miraculous) insulin pump to keep him in balance. We also change his pump site every two to three days, as well as his constant glucose monitor (CGM), another amazing device that keeps us updated on an estimate of his BG. Rachel definitively manages the difficult logistics of this care. She deals with insurance companies, refills at the pharmacy, and talking to the reps at Animas (insulin pump) and Dexcom (CGM). Rachel and I both deal with the daily stresses of handling diabetes. We both count carbs, take BG readings, get up in the middle of the night and evenly split the duties of changing Henry’s pump and CGM sites. Henry has developed a pretty nasty allergy to the tape that holds both of these machines onto his skin, so we have to take a lot of precautions to make sure that his exposure to them is minimized. Rachel reached out to the diabetes online community and found people who helped us come up with solutions when our docs had basically given up and asked us to go to multiple daily injections. The best balance that we have, in terms of day-to-day care, is that Rachel is very good at keeping track of what Henry needs medically and practically; she amazes me with how much she has learned about diabetes and its care— and I am helpful in the ways that I try to create some distance from a life with diabetes and a “normal” life for Henry. I’m probably more likely to encourage us to get ice cream or wait to change a site— this balance only functions because of how hard Rachel works. Rachel: In the wise words of Kenny Rogers, “Know when to hold ‘em, / Know when to fold ‘em / Know when to walk away / Know when to run.” I know when to hold ‘em, which comes in handy with the rigor and attention counting carbs and dosing insulin requires. Matt knows when to fold ‘em and let Henry live the life of a five year old with birthday parties, extra ice cream, and a day longer with a site. Henry will need both of these skills as he learns to live and manage his diabetes. Balancing diabetes is an art and a science, so I’m the science while Matt’s the art. Matt and I both know when to walk or run away from a negative comment, failing site, or excessive carb scene. Matt: I don’t think it’s changed us fundamentally. We don’t always agree about everything to do with Henry, but we always talk about why we think a certain action is best in the certain moment. Ultimately, we are both focused on making sure that Henry is safe and protected. Chronic conditions are definitely an added stressor, and I’m sure that we get a little snappier at 3:00 in the morning, but we are both committed to each other and to caring for Henry. Rachel: A lot, but a little. A lot because we are now caregivers for our son, who has a chronic condition, but not a lot because we decided to become partners and then parents together long before diabetes entered our lives, so we’ve mostly figured out how to handle stress and difficulty. A day to day difference is struggling with time, because everyday actions, such as preparing for a trip or eating at a restaurant, are now more complex and require discussion, preparation, and planning. We have to depend on each other more. Rachel: We both do really hard things. For the past 18 months I’ve put in Henry’s pump site, which feels like I’m stabbing him with a giant needle. Henry anticipates site changes, and it’s just awful to know that I’m causing my child physical pain, even if it’s for treatment. When Henry asks something like, “Will I have diabetes when I’m a grown up?” Matt can answer this question honestly and have Henry laughing within a few minutes, whereas I have to leave the room because I don’t trust myself to answer without getting choked up. Matt: We have split things up, but we talk or text at least two or three times a day about his care when we are both at work. Changing the site of Henry’s pump is stressful because of the precautions we have to take with his skin and because he dreads them. We put Lidocaine on his skin to decrease the pain but they still worry him. I prep the area on his skin and get the pump primed to administer insulin and hold him while Rachel actually inserts the pump. Rachel: Matt’s superpower is levity that inspires patience and laughter, needed in the shadow of a wrong number at the right moment. Matt: Rachel’s superpower is her love for Henry and how this gives her a laser-like focus on keeping him alive. November 14th is World Diabetes Day. November 14th marks the 618th day our family has been living with type 1 diabetes. To be sure, it’s difficult to measure or assess the emotional toll of living with diabetes, but there are ways we can measure the impact of living with type 1 diabetes. Here’s a look at Henry’s 2015 type 1 diabetes index. At the end of the blog, there’s a video where some of these numbers are juxtaposed to our everyday life, creating just a glimpse into the emotional side of living with type 1 diabetes.